DEFA Link Hub gives you remote control possibilities of your DEFA WarmUp, Security, and Finder system in your vehicle, from anywhere in the world. 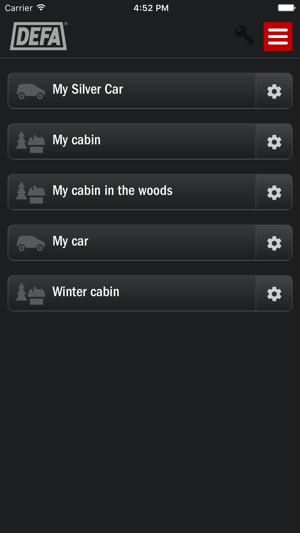 You can also connect the Link Hub to your DVS90 car alarm system to get burglar alarm notifications. DEFA Bluetooth® Hub gives you local control of your DEFA WarmUp system in your vehicle. Only devices supporting Bluetooth® Smart and using iOS 8.0 and newer can communicate with the Bluetooth® Hub. DEFA Base Unit PRO and Base Unit DIY gives you remote control possibilities of your DEFA Home heating and alarm system in your cabin or house, from anywhere in the world. Turn engine and interior heater ON and OFF directly or by a timer. The system will automatically start pre-heating depending on outside temperature or according to fixed pre-heating times. You can also monitor whether the 230V mains cable is connected or not. With Link Hub you can monitor the battery voltage of the vehicle and get an alert when the battery voltage is low. You can also monitor inside and outside temperatures. With Bluetooth® Hub you can monitor the outside temperature and the battery voltage of the vehicle. Be alerted if your vehicle is stolen (started and/ord moved) or if your pre-configured speed limit is exceeded. You can also look up your vehicle on a map at any time. Control heating for up to 6 separate zones. 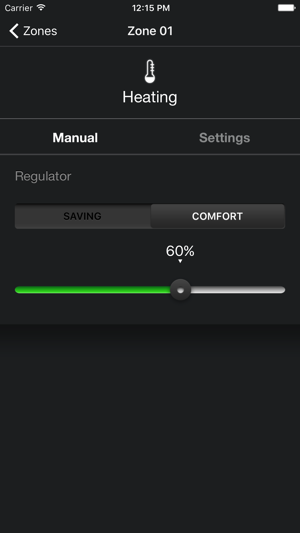 You can set each zone to manual ON/OFF, thermostat or regulator modes independently. 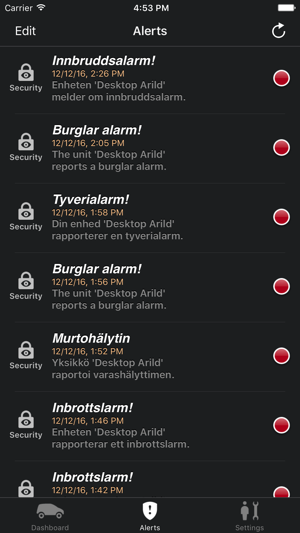 Turn burglar alarm ON/OFF. 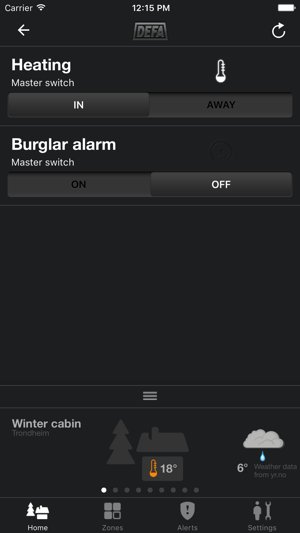 Remote control your Nobø thermostats directly. In addition, the weather forecast is displayed for your location. The system will monitor power outages, monitor up to 6 different temperatures, and a range of additional features. You can also connect wireless burglar- and smoke detectors. 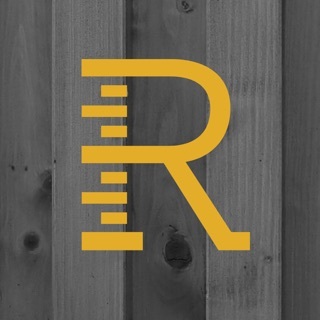 All features are available through this app. Alerts are sent to your phone and/or email. Note! DEFA Link Hub and Base Unit products require a subscription. 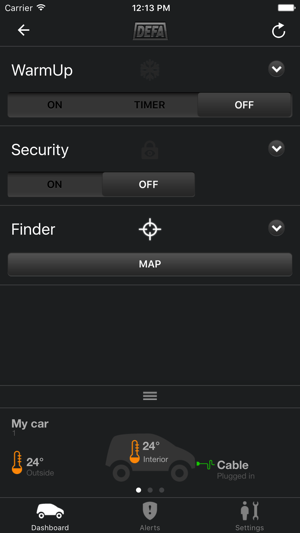 DEFA Bluetooth Hub does not require a subscription. All products require an installation of hardware. For more information see www.defa.com or ask your DEFA dealer. - Removed bugshaker, as it is too sensitive and needs configuration. Thanks for all the feedback so far. Må støtt og stadig logge av og på for å få kontakt med bilen, dette er for dårlig..
Må åpne, så lukke, så åpne igjen for at appen skal kicke inn og vise bilen. Burde hatt varsling på mobil et par minutter (eller valgfritt) før hentetid om å huske å koble fra ledning.